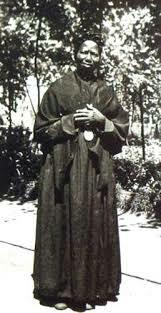 Saint Josephine Margret Bakhita was born in the year 1869 in the western Sudanese region of in the village of Olgossa,West of Nyala and close to mount Agilerei. At the age of nine, she was kidnapped by Arab slave traders, who already had kidnapped her elder sister two years earlier. She was cruelly forced to walk barefoot about 960 kilometres to El Obeid and was already sold and bought twice before she arrived there. Over the course of twelve years (1877–1889) she was resold again three more times and then given away. It was said that the trauma of her abduction caused her to forget her own name, she took one given to her by the slave master, ”Bakhita” an Arabic word which means” Lucky”. She was also forcefully converted to Islam. In El Obeid, Bakhita was bought by a very rich Arab merchant who employed her as a maid in service to his two daughters. They liked her and treated her well, But after offending one of her owner’s sons, for breaking a vase, the son lashed and kicked her so severely that she spent more than a month unable to move from her straw bed. Her fourth owner was a Turkish general, she had to serve his mother-in-law and his wife who both were very cruel to all their slaves. Bakhita said “During all the years I stayed in that house, I cannot recall a day, that passed without a wound or other. When a wound from the whip began to heal, other blows would pour down on me”. She said the most terrifying of all her memories, was when she (in common with other slaves) was marked by a process resembling both scarification and tattooing. As her mistress was watching her with a whip in her hand, a dish of white flour, a dish of salt and a razor were brought by a woman. She used the flour to draw patterns on her skin and then she cut deeply along the lines before filling the wounds with salt to ensure permanent scarring. A total of 114 intricate patterns were cut into her belly and her right arm. In the year 1882, El obeid came under the threat of an attack of Mahdist revolutionaries.The Turkish general began making preparations to return to his homeland, He sold all his slaves but selected ten of them to be sold later.On his way through Khartoum,in 1883 Bakhita was bought by the Italian Vice Consul Callisto Legnani, who doesn’t use the lash when giving orders and treated her in a loving and cordial way. Two years later, when Legnani himself had to return to Italy, Bakhita begged to go with him. By the end of 1884, they escaped from besieged Khartoum with a friend, Augusto Michieli. They traveled a risky 650-kilometer (400 mi) trip on camel back to Suakin, which then was the largest port of Sudan. In March 1885 they left Suakin for Italy and arrived at the Italian port of Genoa in April. They were met there by Augusto Michieli’s wife, Signora Maria Turina Michieli. Callisto Legnani gave the enslavement of Bakhita to Turina Michieli as a present. Bakhita’s new masters took her to their family villa at Zianigo near Mirano Veneto, about 25 km (16 mi) west of Venice. She lived there for three years and became nanny to Michieli’s daughter Alice, known as Mimmina, born in February 1886. The Michielis brought Bakhita with them to Sudan for nine months before returning to Italy. Suakin in Sudan was besieged but remained in Anglo-Egyptian hands. Augusto Michieli acquired a large hotel there. As such, he decided to sell his entire property in Italy and to move his family to Sudan permanently. Selling his house and lands took much longer than expected. By the end of 1888, Turina wanted to see her husband in Sudan even though land transactions were not finished. Since the villa in Zianigo was already sold, Bakhita and Mimmina needed a temporary place to stay while Turina went to the Sudan without them. At the advice of their business agent Illuminato Cecchini, on 29 November 1888, Signora Turina Michieli left them in the custody of the Canossian Sisters in Venice. When she returned to take them both to Suakin, though, Bakhita firmly refused to leave. For three days Mrs Michieli tried to force the issue. So, the superior of the institute for baptismal candidates (Catechumenate) that Bakhita attended complained to the Italian authorities. On 29 November 1889 an Italian court ruled that, because the British had induced Sudan to outlaw slavery before Bakhita’s birth and because Italian law did not recognize slavery, Bakhita had never legally been a slave. For the first time in her life Bakhita found herself in control of her own destiny. 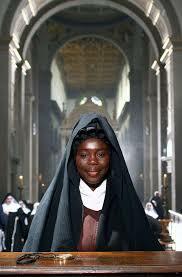 She chose to remain with the Canossians .On January 9, 1890 Bakhita was baptised with the names of Josephine Margaret and Fortunata (which is the Latin translation for the Arabic Bakhita). On the same day she was also confirmed and received Holy Communion from Archbishop Giuseppe Sarto, the Cardinal Patriarch of Venice himself. 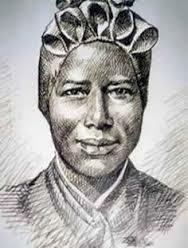 On 7th December 1893 Josephine Bakhita entered the novitiate of the Canossian Sisters and on 8 December 1896 she took her vows, welcomed by Cardinal Sarto. In 1902 she was assigned to the Canossian convent at Schio, in the northern Italian province of Vicenza, where she spent the rest of her life. Her only extended time away was between 1935 and 1939, when she stayed at the Missionary Novitiate in Vimercate (Milan), mostly visiting other Canossian communities in Italy, talking about her experiences and helping to prepare young sisters for work in Africa’s strong missionary drive animated her throughout her entire life – “her mind was always on God, and her heart in Africa”. During her 42 years in Schio, Bakhita was employed as the cook, sacristan and portress (door keeper) and was in frequent contact with the local community. Her gentleness, calming voice, and ever-present smile became well known and Vicenzans still refer to her as Sor Moretta (“little brown sister”) or Madre Moretta (“black mother”). Her special charisma and reputation for sanctity was also noted. The first publication of her story (Storia Meravigliosa by Ida Zanolini) in 1931, made her famous throughout Italy. During the Second World War (1939–1945) she shared the fears and hopes of the town people, who considered her a saint and felt protected by her mere presence. Not quite in vain as the bombs did not spare Schio, but the war passed without one single casualty. Her last years were marked with pains and sickness,which resulted to her using a wheelchair, but she retained her cheerfulness, and if asked how she was, she would always smile and answer “as the Master desires”. She died at 8:10 pm on the 8th of February 1947, at Schio Veneto, republic of Italy. Venerated on 17th may 1992 at St peter’s Basilica. Beatified on 1st October 2000, Canonized at St. Peter Basilica by pope John Paul 11. 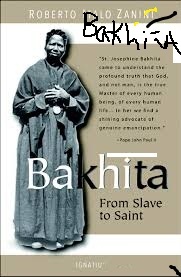 Feast of St. Bakhita is on 8th February. SPEAK OUT NOW BEFORE THEY COME FOR YOU!!! Stay informed - Kindly subscribe to our weekly email newsletter for updates on news and events.